Hiroshima Nagasaki Peace Mask Project has been created to honor the nuclear bomb survivors (Hibakusha) and their descendants for their 72-year effort of carrying onward a light of peace and understanding. While doing so, they and their primary organization, Nihon Hidankyo, have been reminding the world of the ultimate danger of nuclear weaponry. As the number of first generation Hibakusha continue to decline, their testimonies are rapidly becoming forgotten. For its sustained efforts, Nihon Hidankyo, was once again (2016) nominated for the Nobel Peace Prize. Peace Mask Project aims to keep fulfillment of the Hibakusha efforts at the forefront of public attention. Our ultimate purpose is to facilitate reflection and discussion concerning the continuing global threat of living in an increasingly dangerous nuclear-armed world. The global community must conceive of a future that chooses to reduce and eventually eliminate its nuclear arsenals; to disarm its remaining thousands of missiles before technical error, politically generated fears, or a rogue launch unleashes the unthinkable. 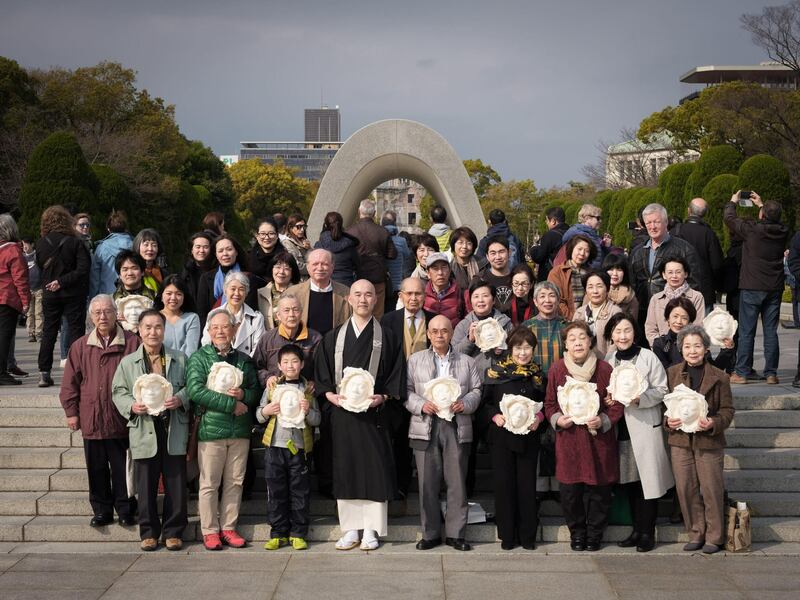 Hiroshima Nagasaki Peace Mask Project completed 100 Peace Masks of 1st to 4th generation nuclear bomb survivors, from both Japan and a representative number of other countries. The final event took place in March of 2017, at the Hiroshima Peace Memorial Museum (pictured above). Peace Mask Project is currently looking for a permanent exhibition space for the Hibakusha Peace Masks at an internationally appropriate location(s). We welcome inquiries from peace and anti-nuclear weapons organizations and concerned individuals to make this goal a reality.